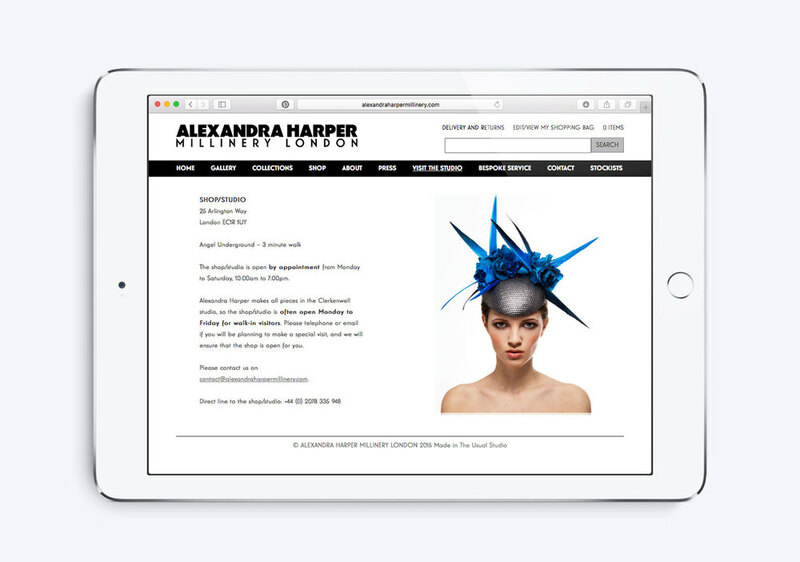 London-based milliner Alexandra Harper, has been designing and producing statement hats and headpieces since her label launched in 2004. We were commissioned by Forward PR to rebrand the brands visual identity, design and build a stylish, e-commerce website, new stationery, swing tag and social networking cover images. Alexandra's style is a combination of classic millinery blended with innovative techniques and hand craftsmanship. Her work has attracted the attention of Disney Company UK with whom she now regularly produces collections for. The brand has been featured widely in the style press including The Sunday Times Style, ELLE, Vogue, Grazia and Marie Claire and is now stocked at Fortnum & Mason. To create an identity suitable for such a progressive designer we knew we needed to create a really strong, high fashion identity so we based the logo design on a heavy titling font, which was customised to suit. The website is a custom WordPress website featuring an e-commerce shop, press section and easy to update gallery. CSS3 techniques were used to create transparent frames for the collection images. The site's fully optimised for mobiles and tablets. Interview with Alexandra Harper inside her studio where she discusses how she creates each piece of millinery by hand and her 4 collection collaboration with Disney.